With having that Landscape Design done and in hand you know have to pick out the ground cover for these beds, river rock or hardwood mulch? Hardwood mulch or color enhanced dark brown mulch is easier on the plant material however needs to be refreshed yearly. 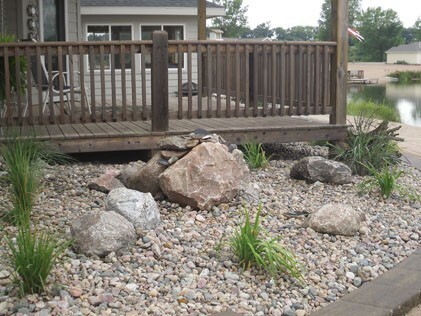 With going with the rock look there is many options available such as the common river rock up to the more specialty rock such as cherokee or sunset. The same goes for flagstone, river boulders, and moss rock, there are many options and colors available so contact us today!